Juliana Crawford/Courtesy photoStephanie Monseu is the fourth woman to serve as ringmaster of Big Apple Circus, which will be at the Northshore Mall for a month starting today. Juliana Crawford/Courtesy photoFifth-generation circus performer Emil Faltyny balances on a crooked ladder. Juliana Crawford/Courtesy photoSpicy Circus will bring its trampoline antics to the big top. Juliana Crawford/Courtesy photoAnimal trainer Jenny Vidbel will bring her menagerie of rescue animals. Pictured here is Kadier. Juliana Crawford/Courtesy photoMark Gindick, left, and Adam Kuchler do their clowning without face paint at Big Apple Circus. Juliana Crawford/Courtesy photoDesire of Flight brings aerial elegance to Big Apple Circus, running today through May 5 at Northshore Mall in Peabody. Juliana Crawford/Courtesy photoCharlie, a rescue dog, takes a drive around the tent as part of animal trainer Jenny Vidbel's presentation. Juliana Crawford/Courtesy photoIn DuoFusion, Virginia Tuells wears high heels while supporting her husband, Ihosvanys Perez. Juliana Crawford/Courtesy photoIn DuoFusion, Virginia Tuells holds her partner, Ihosvanys Perez, in a balancing act that requires great strength. Ringling Bros. and Barnum & Bailey Circus may have folded up their tents for good in 2017, but that wasn’t the end of circuses. Rather, it shows the declining popularity of the three-ring extravaganza, which started in the 19th century but lost its appeal in the era of movies, television and other forms of mass media. 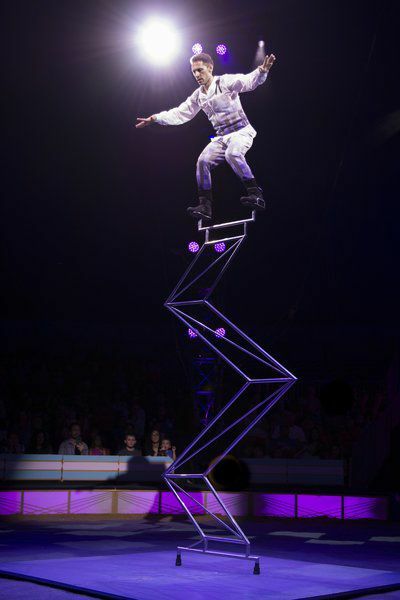 “The desire to be in these huge public spectacles wasn’t as grand anymore,” said Stephanie Monseu, ringmaster of the Big Apple Circus, which opens at the Northshore Mall in Peabody today and runs through May 5. “What becomes special in today’s culture is the small, intimate, one-ring experience that shows like Big Apple offer,” she said. The Big Apple Circus is now in its 41st year, and Monseu became the fourth woman to serve as its ringmaster this past fall, when the season opened on Oct. 26 in New York. Monseu also loves the fact that Big Apple Circus is inclusive and holds enhanced events for audience members who are blind, deaf, low-vision or autistic. “This is for everyone,” she said. Monseu, who also leads the Bindelstiff Family Cirkus, which she founded in 1994, said that one main similarity between circuses of the past and today is that they are still affordable family entertainment. That’s why the acts that appear in the single ring of Big Apple Circus feature unique qualities that might get lost in a bigger arena. Clowns Mark Gindick and Adam Kucher, for example, create characters that are funny but also connect with the audience in a personal way. “The makeup is scaled-down, the look is scaled-down, the subtlety of gesture is at the surface and easier to connect with in this scale,” Monseu said. That “relatability” helps the clowns create “an emotional connection” for the audience between acts, Monseu said. That is also part of her role as ringmaster, which is to welcome the audience, help them feel comfortable and prepare them for the acts that they will see in the ring. These include Spicy Circus, a trampoline troupe in which the members bounce up, over and through a wall. If they don’t create enough butterflies in the pits of everyone’s stomachs, there is also The Flying Tuniziani, a group of trapeze artists with seven fliers and two catchers. Emil Faltyny will also appear, performing acrobatic tricks on a series of ladders that lean on nothing but air and some of which are designed to be unstable. But while each of these acts may seem impossible to do, and even magical, Monseu stresses the hard work and commitment of the performers. While sharing remarkable feats, some acts also challenge conventional notions about things like gender roles. That is the case with Duo Fusion, a balancing act featuring Virginia Tuells, a native of Argentina, and her husband, Ihosvanys Perez, from Cuba. The act started in 2007, after the couple met in Mexico in 2003, where both were performing in a circus. As Duo Fusion, the pair works together with the elegance of dancers, performing acrobatic moves that involve feats of great strength and coordination. “What makes us unique is that, normally, the man lifts the woman, but in our case, I lift Ihosvanys,” Tuells said. Not only that, but she does it while wearing a pair of high heels. She may even be “the strongest mom in the world,” as Big Apple Circus has billed her, since Tuells had a daughter 15 months ago and went back to the ring three months after giving birth. This was made more difficult by that fact that she felt like a different person after Sofia, the couple’s daughter, was born. She said that the most difficult moments in the act are at the finale, when both performers are getting tired, and also when she is holding her husband on her shoulder. “If he’s moving, or out of center of balance, I have to absorb all that with my strength, like a tree, not moving at all,” Tuells said. But she loves what she does and has since she saw her first circus at age 18, at a point when she was growing tired of gymnastics. How much: Tickets are $25 to $80, available at www.bigapplecircus.com/tickets, www.ticketmaster.com and 800-745-3000. 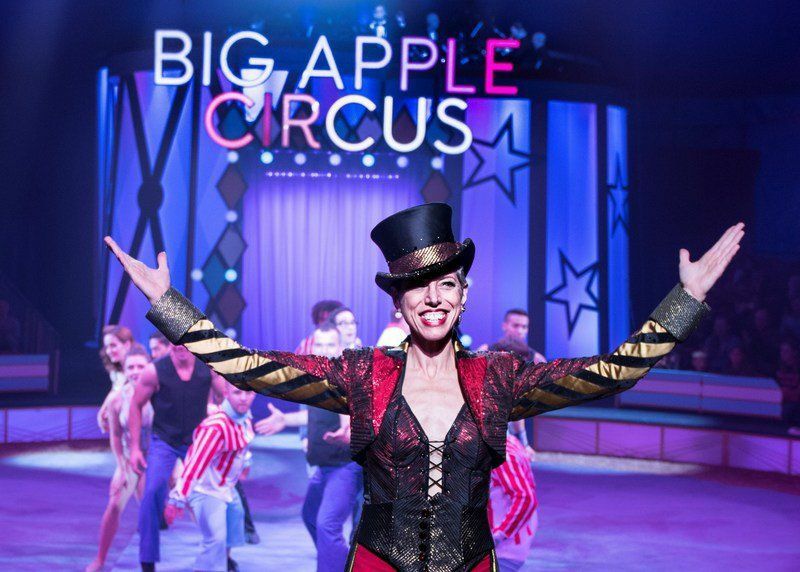 For groups of 10 or more, call 212-257-2330 or email groupsales@bigapplecircus.com. Free parking is available on-site. Circus of the Senses, on Sunday, April 14, at 11 a.m., offers enhanced experiences for audiences who are blind, deaf or low-vision. The performance includes ASL interpretation, live audio description, pre- and post-show touch experiences, and a Braille descriptive program. Sensory-friendly autism performances, on Saturday, April 6, and Friday, April 12, at 11 a.m., will feature lowered light and sound levels, a descriptive social story showing the different areas and acts involved with the circus, and a “calming center” that can be accessed at any point during the show.